Packaged by Nutiva. The same product as our best selling 54 oz. Nutiva Organic Virgin Coconut Oil. Coconut is a superfood with a light tropical scent and flavor. 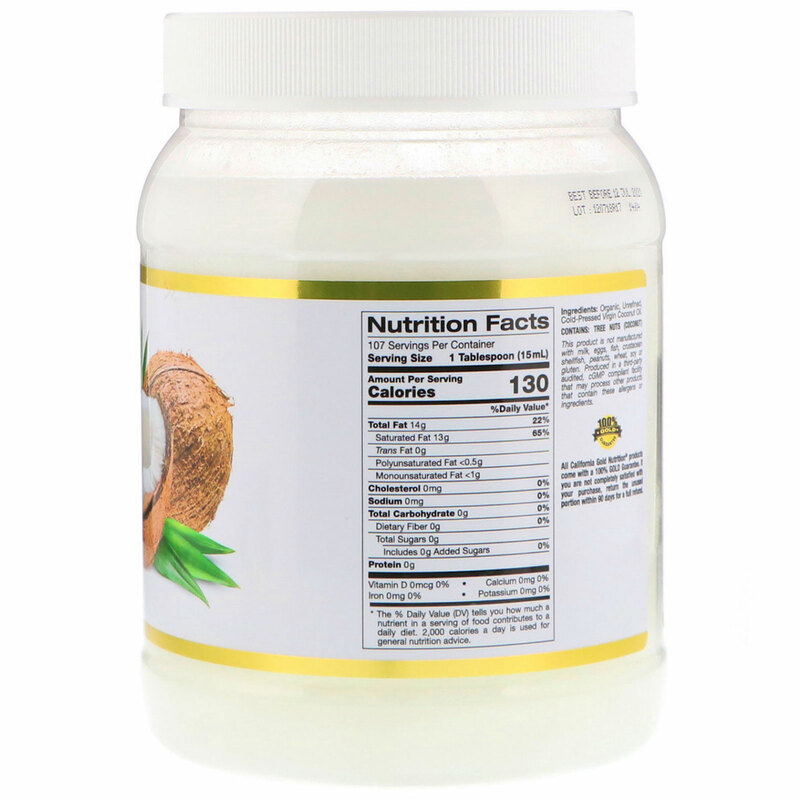 Coconut oil is rich source of Medium Chain Triglycerides (MCTs), such as lauric, capric and caprylic acids, which studies have demonstrated to be supportive of energy production within the brain and, along with diet and exercise, promote weight loss. * Organic Virgin Coconut Oil is made by cold pressing the liquid from coconut meat and then separating the oil without the use of bleach to produce a smooth unrefined virgin oil. It is GMO, Hexane and Pesticide free. 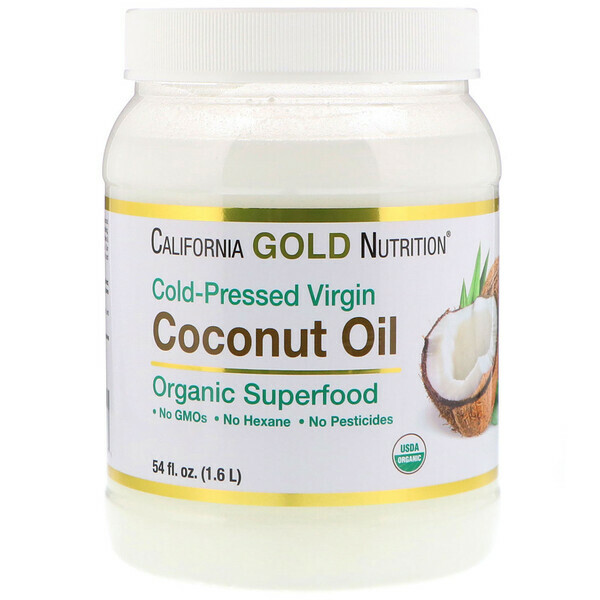 California Gold Nutrition’s Organic Virgin Coconut Oil is sourced from the Philippines, Vietnam, Sri Lanka and Indonesia, manufactured in the USA, Triple-Quality Tested and meet or exceed all qualitative and quantitative Quality Control specifications. Our Organic, Unrefined, Cold-Pressed Virgin Coconut Oil is ideal as a medium-heat cooking oil - best for baking or sautéing, but not suitable for frying. Simply add it to your shakes, smoothies & salad dressings or use as a substitute for butter or olive oil. Our Coconut Oil is also excellent when used externally on skin & hair, and as a carrier oil for massage. This product is not manufactured with milk, egg, fish, crustacean shellfish, peanuts, wheat, soy or gluten. Produced a third-party audited, cGMP compliant facility that may process other products that contains these allergens or ingredients. Storage: Store in a cool, dry place. Refrigeration not required; Solid at temperatures below 76°F and Liquid at temperatures above 76°F. Note: Naturally occurring, tiny brown particulate is normal and does not affect product quality.